Pickup trucks aren’t all rust and mud. Beneath that, they distinguish themselves with unique exterior features and proportions. 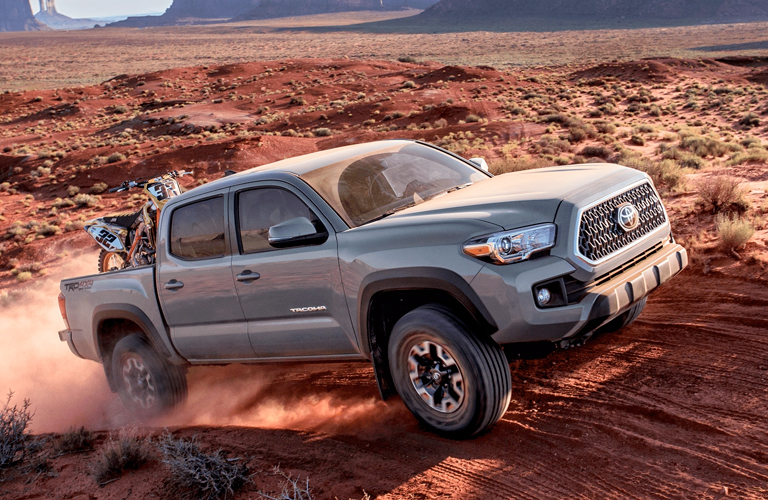 The 2019 Toyota Tacoma lets itself shine with or without a coating of mud from your latest adventure. Keep reading to learn about the 2019 Toyota Tacoma exterior design features. Your pickup’s lighting will make all the difference on your next road trip. The standard projector-beam headlights will illuminate your path at night, while the available LED Daytime Running Lights (DRL) will light the way at all times of the day. That way, you’ll never be missed. Many pickup trucks make it difficult or impossible to open the rear window, but not the 2019 Toyota Tacoma. In this truck, you can let all the windows down and enjoy a cool breeze. The available power sliding rear window with privacy glass is operable with a one-touch button, making it the easiest process imaginable to let the outdoors inside. You are going to be proud of the way your 2019 Toyota Tacoma looks. The type of proud that makes you want to tell the world, and you can with the embossed tailgate. Everyone will know you drive a Tacoma because it says it right there. Plus, the grade-specific taillights will tell a Tacoma fan what trim level you have. We know how impressed you will be with the 2019 Toyota Tacoma exterior design because we see it every day on our lot. It is time for you to see it too. Pay us a visit here at Lexington Toyota, and we will make the introduction. This entry was posted on Thursday, February 7th, 2019 at 5:16 pm	and is filed under Toyota Tacoma. You can follow any responses to this entry through the RSS 2.0 feed. You can leave a response, or trackback from your own site.